Summary: Set on the hottest day of the summer, the film examines various personal, social and economic issues through the eyes of an ensemble of neighborhood characters on a Bedford Stuyvesant block in Brooklyn. Bottom line: With Do the Right Thing, Spike Lee is able to start a conversation about race in America, pointedly and brilliantly. In Do the Right Thing, we watch an urban New York neighborhood during a heat-wave. Racial tensions smolder before erupting into violence. It is one of thoseBottom line: With Do the Right Thing, Spike Lee is able to start a conversation about race in America, pointedly and brilliantly. In Do the Right Thing, we watch an urban New York neighborhood during a heat-wave. Racial tensions smolder before erupting into violence. It is one of those movies that’s difficult to summarize; there are numerous characters whose plot lines intertwine but the core of the movie looks at the larger issue of racism. We have the Italian American, Sal (Aiello), who has owned the neighborhood pizza shop for twenty-five years. On one wall, he has a “Wall of Fame” which features photos of Italian-Americans. He refuses to put up any African or African-American photos. His son is a racist. We have the patron, a militant black power character, who vows to boycott Sal’s until there are Africans represented on the wall. Meanwhile, we have the brutal, white police officers. We have the Chinese owners of a local grocery store. We have the Hispanic community. 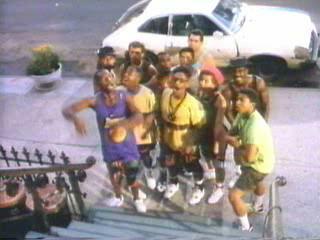 We have Radio Raheem (Nunn) who blares Public Enemy on his boombox. Spike Lee is able to present the complexity of this issue, and this film-world, with coherence and harmony. This is what makes Do the Right Thing so good. The important part about this movie is that there is no one completely at fault. It may not sound like much, I mean, we have antiheroes all the time, right? Here though, the purpose is to spark a dialog about race in America. The movie closes with two quotes. The first is a warning from Martin Luther King Jr. about the dangers of violence. I thought, “Alright, I get it. All of the destruction in the movie could’ve been avoided by choosing peace.” Then comes a statement by Malcom X saying that while he doesn’t condone violence, violence might be necessary in self-defense and he does condone self-defense. Even in conclusion this movie presents more than one perspective. In Do the Right Thing, the message is as ambiguous as the film’s title. What is the “right thing?” Of course, we all want to do that but how do we know what it is? Even if we do know the right thing, it’s a lot easier said than done. Aside from a story perspective, Spike Lee fully uses the medium of film. It is a very hot summer day so he shows three old men sitting in lawn chairs partially covered by an umbrella. They sit in front of a fire-engine red brick wall. The color in and of itself makes the audience feel the warmth of that summer day. It reminded me of a Rothko painting. In other situations, Lee uses a wide-angle lens pushed close up to the actors who speak directly into the camera. It is an uncomfortable angle to watch and listen to someone scream at you. That’s the point. Our proximity to the characters removes any chance we have of escaping the situation. It’s as if the film is telling us that we have to address these issues. I just finished listening to an audio version of Steven Pressfield’s The War of Art. It is about tackling the resistance that is preventing you from doing what you truly dream. At one point, he explains that in writing this book, his own demons of resistance fought him. He said to himself, “I am a fiction writer. Shouldn’t I, instead of writing a nonfiction book like this, cloak the same message in metaphor? I could write a story about a soldier’s trials and tribulations as he undertakes a mission.” Do the Right Thing is like The War of Art in the sense that it is not a message hidden in a film, it a direct message in and of itself. Spike Lee uses jump cuts help develop this idea. A jump cut is where the camera moves slightly between two shots. It moves in such a way that you can tell there was a cut. I have a bunch of jump cuts in my review videos, if you want to see an example. Up until around the 1960’s, cut jumps were considered more a mistake than anything. They are jarring and make you aware of the camera so it breaks some level of immersion. So, by using a couple jump cuts, Lee is able to address the audience and the audience’s interaction with the film. That is, we aren’t going to get too caught up in the plot that we lose sight of the fact that this is a movie with a message. Do the Right Thing is a cinematic representation of a speech or an editorial; it not only tells you but it shows you. 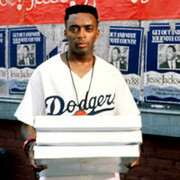 I'm pretty sure I forgot to breathe during some parts of Spike Lee's 'Do The Right Thing'. Not only because the way it penetrates the mind and soul of any sensible viewer, but also because I felt ashamed by the approach I took to this movie. With a stunning Public Enemy soundtrack, II'm pretty sure I forgot to breathe during some parts of Spike Lee's 'Do The Right Thing'. Not only because the way it penetrates the mind and soul of any sensible viewer, but also because I felt ashamed by the approach I took to this movie. With a stunning Public Enemy soundtrack, I expected this film to be a Black Power Movement propaganda. Was I wrong! It is 1989, a 32 year-old black man decides to make a film about race and discrimination. His approach, though, is as impersonal as it gets. He fills a Brooklyn Street during a single steaming hot summer day with every single racial representation of American immigrants. There is a Korean grocery store and an American-Italian Pizzeria, ran by the father Sal (Danny Aiello) and his two reluctant sons Vito (Richard Edson) and Pino (John Turturro) all set in a neighborhood dominated by African-Americans and even Latinos. There are no heroes and no villains among them. The plot is far from your average structure. It manages to deconstruct and implode upon itself in a slow and procedural manner like few films achieve. By keeping the location small, Lee succeeds in presenting us all the characters in a great, great level of detail, unraveling the hatred and subconscious cultural manners and views that are in every one of us through slow and wise writing and directing. Lee often lets these characters express themselves in a unique approach which I have never seen in any other film. 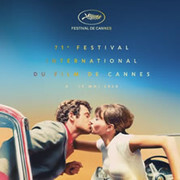 Often they would be filmed from the front, and in a brilliantly executed subtle transition they would talk about themselves and their beliefs as if the entire film would decompose and it was just you and them. It is this technique alone, which allow the very essence of their personality to be revealed. There is a scene, in which Lee lets nearly every character spew racial slurs, almost signaling that through this hot day something waits to happen! And it does. It all builds up after Buggin' Out (Giancarlo Esposito) claims that among the Italian heroes there should be pictures of some 'black folks' on Sal's Pizzeria, to which Sal disagrees. From this rather banal issue, Spike Lee created a sprawl of hatred which ends in tragedy. But, it is not the issue which fuels the hatred, but it is the self-loathed delivery of their characters, each of them believing their truth to be the truth. The only exception is Da Mayor (Ossie Davis); an old man filled with regrets, wondering around the streets like a preacher of sorts. But, in the end, he is the only man which transcends race and eludes true love to all the characters, even though most of them despise him. In Do the Right Thing, Spike Lee has painted an astonishingly honest and human depiction of racial prejudice and ignorance. Lee presents us with a multitude of complex characters from a wide spectrum of racial and cultural backgrounds and portrays their involvement and experiences with raceIn Do the Right Thing, Spike Lee has painted an astonishingly honest and human depiction of racial prejudice and ignorance. Lee presents us with a multitude of complex characters from a wide spectrum of racial and cultural backgrounds and portrays their involvement and experiences with race issues on an very personal level. Do the Right Thing is [pun included] doing the right thing! Nothing can prepare its laughter when watching this classical movie and nothing can compare how funny it is to other movies. I knew that Spike Lee has one of the most unique and idiosyncratic styles of directing ever from what I've read and seen about him. I got a glimpse of this when I saw BlacKkKlansman; but it left a lot to be desired, and I was thirsty for more. Having just seen hisWhat a hectic film! I knew that Spike Lee has one of the most unique and idiosyncratic styles of directing ever from what I've read and seen about him. I got a glimpse of this when I saw BlacKkKlansman; but it left a lot to be desired, and I was thirsty for more. Having just seen his masterwork, I can say that I'm completely enraged, and that's completely fulfilling and satisfying, to be honest! I was forced to watch this movie for a school assignment. I was excited to see it because of the reviews that it had. To say the least I was totally disappointed. I thought it was poorly written and directed. Worse yet the theme of the movie only encourages the rift between races.